"You won't get another opportunity like this." 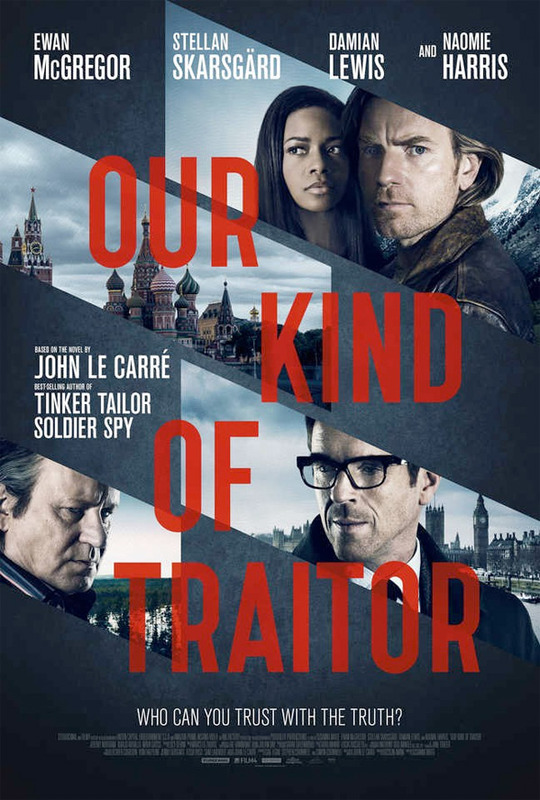 Lionsgate & Roadside Attractions have released the trailer for Our Kind of Traitor, adapted from the John le Carré novel of the same name (other recent John le Carré adaptations include Tinker Tailor Soldier Spy and A Most Wanted Man). Starring Ewan McGregor and Naomie Harris, this thriller is about an unsuspecting English couple that get looped into deep Russian mafia trickery while on vacation. Also starring Damian Lewis, Stellan Skarsgård, Jeremy Northam, Alicia von Rittberg and Mark Stanley. Maybe I'm just not a big John le Carré fan, or maybe the scripts get watered down in translation, but these stories all seem a bit bland to me. I'm still curious to check it out. While on holiday in Marrakech, an ordinary English couple, Perry (Ewan McGregor) and Gail (Naomie Harris), befriend a flamboyant and charismatic Russian, Dima (Stellan Skarsgård), who unbeknownst to them is a kingpin money launderer for the Russian mafia. When Dima asks for their help to deliver classified information to the British Secret Services, Perry and Gail get caught in a dangerous world of international espionage and dirty politics. The couple is propelled on a perilous journey through Paris and Bern, a safe house in the French Alps, to the murky corners of the City of London and an alliance with the British Government via a ruthless and determined MI6 agent (Damian Lewis). Our Kind of Traitor is directed by British filmmaker Susanna White, of Nanny McPhee Returns previously and lots of TV work. The screenplay is written by Hossein Amini, based on John le Carré's novel of the same name. Lionsgate and Roadside Attractions will release Our Kind of Traitor in select US theaters starting July 1st this summer. Stellan Skarsgård is misspelled on the poster. Tinker Tailor Soldier Spy was way too complex for me to the point of borish. Hope this is more intense. Solid cast indeed, but why does it feel like a straight to dvd feature? Agree. Trailer makes it seem that way. Very cookie cutter trailer.